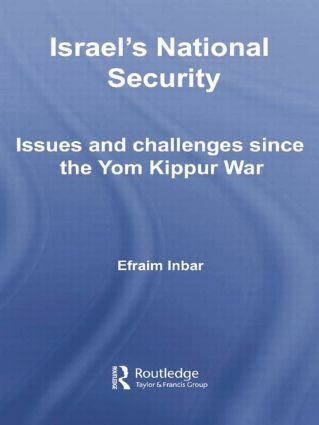 This volume presents a comprehensive analysis of Israel's security challenges since the 1973 October War. Efraim Inbar takes the reader on a historical journey through Israel's relations in the Middle East that begins with an analysis of Israel's strategic thinking after 1973 and ends with an important look at the recent Second Lebanese War and the Iranian nuclear challenge. Israel's National Security delves not only into Israel's responses, but also its relationships in the international community, providing a complete picture of how Israel's strategic environment has evolved over time. Relevant to today's current political atmosphere, the volume dissects the influences of the growing appeal of Islamic extremism on the peace process, Israel strategic partnerships with India and Turkey, and Israel's relations with the Palestinians.